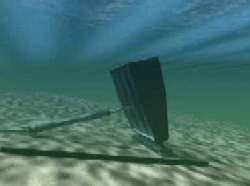 Creativity seems to know no boundaries while inventing concepts to harness ocean power. Recently at Leonardo ENERGY, we devoted a short eBook to this. Hereby another concept from a Finnish company (see AW-Energy Oy). I find the wave turbine concept interesting. It uses a double turbine blade that takes advantage of the pressure created by rising and lowering waves along the side of a mountain. It's free energy and it can potentially produce a lot of them.